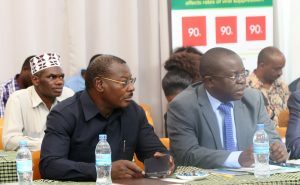 (Ifakara) Ifakara Health Institute (IHI) hosts the Parliamentary Committee on HIV/Aids Affairs and Drug Abuse in an official tour aimed at strengthening engagement with key stakeholders. The Parliamentary Committee on HIV/Aids Affairs and Drug Abuse under the chairmanship of Oscar Mukasa is in Ifakara for three days (September 7-9) to learn how IHI contribute in the global fight against HIV/Aids. IHI Chief Executive Director, Dr. Honorati Masanja, led staff of the Institute in receiving the MPs for an initiative geared to strengthen engagement with key stakeholders – one of the strategic objectives implemented by the Institute for a period of 2018-2023.